Last updated 27 January 2015 . By Drew Manns. Ever been to Williamsburg in Brooklyn? Lost & Found has the feel of an indie NYC cocktail club; with a pop culture referencing menu and interior design that could feature on a few pages in Bushwick art magazine making its mark as soon as you step foot inside. 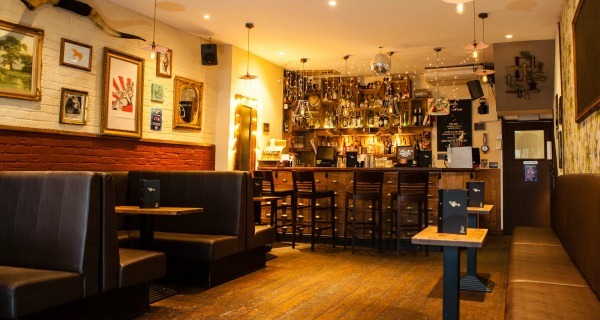 You'll find this cutesy little cocktail bar on Bedford Hill, just a few minutes away from Balham station. The ground floor is charming and cosy, with a few pedestal tables and diner-style booths set up in front of the bar. Crowds come and go, but there's plenty of space downstairs where you'll also find decorative vintage appliances like sewing machines, televisions, and radio sets contributing to the quirky atmosphere. Cosy and warming, Lost & Found is the ideal setting for a few chill out cocktails. Coolness exudes from everything here. One wall is covered with a pastiche of postcards, while another broadcasts a Schrodinger's Cat wanted poster. At some point there were a few couples who proceeded to dance in the middle of the room (surprisingly there was enough space) but for the most part people tended to hang out at the bar and in their seats. I also have to hand it to whoever manages the playlist; Michael Jackson, James Brown, and Elvis ruled the roost all night. Expect a mix of legendary US acts to dominate the speakers. Two of Lost & Found's most popular drinks are Responsibly and the Jean Genie. The Jean Genie's sweet and smooth cucumber mixed with the Hardy gin and lemon is great for the palate, and leaves you a little tipsy but clambering for more. Responsibly is what you should get if you actually had a Genie and you only had one wish. Gosling's Rum comes perfectly poised with the ginger and honey, but be responsible; this luscious libation packs a hefty punch. Some of my other favourites include The 80s Called and Alice in Wonderland, and each drink is as cool and quirky as its name might suggest. If I were some kind of fantasy video game fan (ok, I'm admitting it) I would choose the Corpse Reviver first. 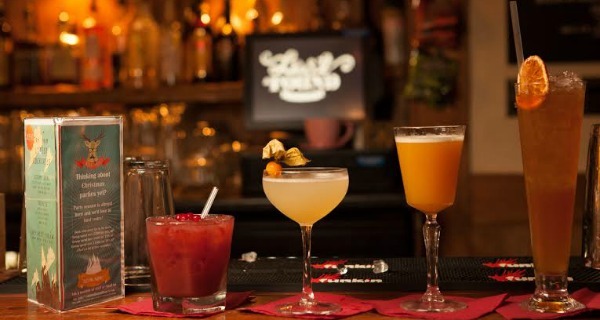 Expertly crafted and creatively named, cocktails at Lost & Found are a joy to behold. The creativity of the drinks and the sincerity of the bar staff are what makes this bar so unique. This is London, but the diverse and innovative vibes help add that authentic New York City edge. Every cocktail at Lost & Found was fantastic, and whipped up faster than a cheeseburger at McDonald's. With the banter from the bar attendants and the general 'feel-good' aura of the place, I promise you won't be able to stop yourself from smiling the rest of the night. Born and raised in the good old USA, Drew is a roving aesthete; seeking only the finest pleasures of London nightlife. He prefers Laphroaig whisky and often sports a broad-brimmed fedora.